• Solution B: 6% (w/v) potassium iodate(V) solution in 0.1 M sulfuric(VI) acid. • Solution C: 1% starch solution. • Solution D: a solution containing 2% (w/v) malonic acid and 0.45% (w/v) manganese sulfate(VI). • Add the solutions to a beaker on an magnetic stirrer in the following order and quantities: 20 ml of solution A, 20 ml of solution B, 1 ml of solution C and 20 ml of solution D.
.The Blue Bottle reactions is usually shown as a trick as you shake the container and it goes blue and on leaving it changes to colourless as glucose uses the blue oxidised form of methylene blue to form oxidised products. Shake the container and oxygen from the air re-oxidises the colourless reduced form of methylene blue to the oxidised blue form. But you keep the reaction still in a 55mm diameter plastic Petri dish, lines of regenerating methylene blue can be seen. I think these are the organised lines, that Alan Turing suggested in the 1950s, could form in a chaotic mixture. I hav tried to show the process in this digram. Other indicators can be used and the indigo-carmine version shows some striking colours, green, red and yellow which is why it is known as the traffic demonstration. I saw this being carried out by teachers in Holland, I have tried to make the arrangement a bit more sturdy and by using Universal Indicator the rotating colours can be seen around both of the electrodes. The colourless liquid was saturated sodium sulfate solution. My electrodes are carbon fibre (2mm diameter) from an online kite shop and connected to 9V battery or a Low Voltage DC supply. The dye is Universal Indicator although bromothymol blue and any other indicator works. Explaining this is not easy but the hydrogen and hydroxide ions are repelled from the electrodes and experience a magnetic force at right angles to the motion. 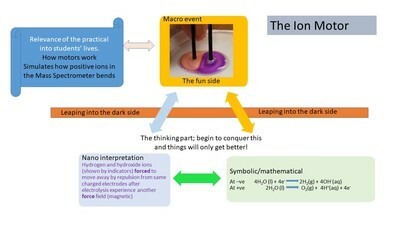 This is similar to the curved path of ions moving in a mass spectrometer. 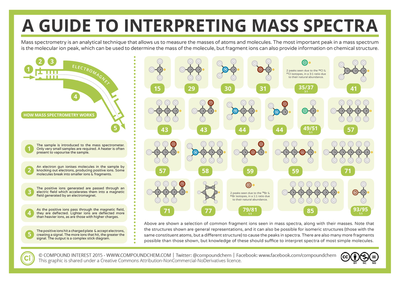 Onethe left is a Mass Spectometer Poster from Compound Interest, http://www.compoundchem.com/2015/05/07/mass-spectrometry/. The positive ions are bent by the action of the magnet. 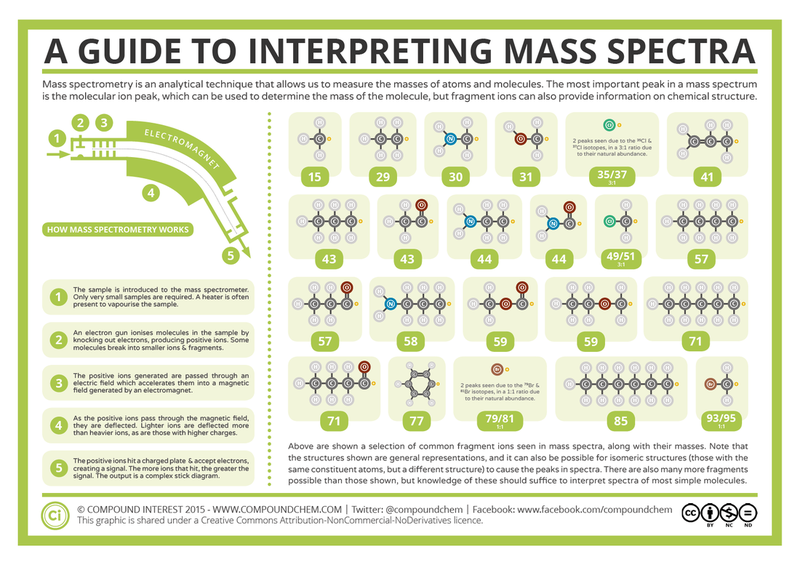 The poster is printed with kind permission of the author. I have also attempted to relate this event to a Johnstone triangle deidcated to this observation. Jorge Ibanez et al published an article on the preparation of the solvated electron in liquid ammonia in J.Chem.Educ.2011, 88, 670–672. 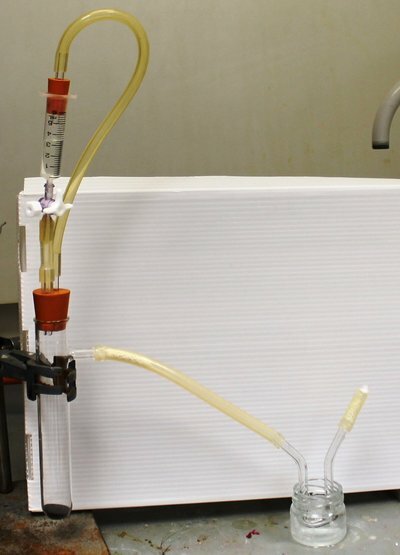 It used very simple equipment and it can be used to show other liquefied gases such as chlorine so long as there is a supply of solid carbon dioxide available. Here is a UK version of his idea and it has been extended to make liquid chlorine (B Pt -34°C). It has to be carried out in a fume cupboard with no flames present. The gas preparation apparatus is shown below. It uses a small scale “Andrews” gas generator. (Mr Andrews was, I believe, an ex Head of Chemistry at Harrow School). It allows the preparation of a gas without pressure blockages. 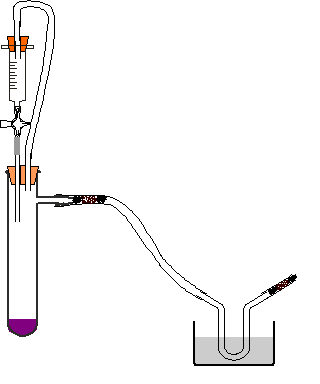 In the syringe on top is concentrated hydrochloric acid and potassium manganate(VII) is the solid as the base of the boiling tube. The 3-way tap is turned to allow the acid onto the purple solid. The gas is then dried with a porous plug of mineral wool holding anhydrous calcium chloride. The dry gas then passes into the U-bend which is cooled with carbon dioxide in propanone to temperatures well below -34°C. 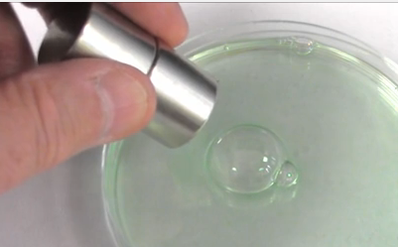 The gas cools to form a yellow liquid. Another porous plug of mineral wool holding anhydrous calcium chloride, prevents moisture entering and condensing in the U-bend. I make the U-bend with 7-mm medium wall borosilicate glass tubing and use a Bunsen burner to make the bends. The solid CO2 would be expensive but working at microsacle level here I can use a special adaptor which firts onto the end of the CO2 cylinder. And yes I did make the solvated electron (blue) in liquid ammonia (see further below). This time warmed concetrated ammonia solution with a beaker of hot water. The U-tube requires a tiny piece of lithium to generate the electron which is solvated by ammonia molecules. And do you see the bronze colourled solid there. I thought the whole event had gone wrong. But no it appaears it could be lihtium lithide (Li+Li-). Throw away the octet rule! (Is this supposed to happen?) Always amazed. Practical evidence illustrating the arrangement of electrons in molecules and atoms is not easy to come by. 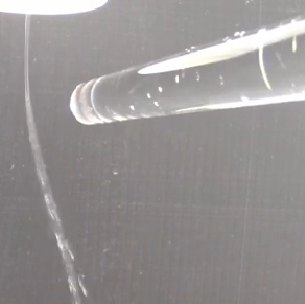 In the video https://www.youtube.com/watch?v=jJmduBDr8Y8, you can see water being deflected by an electrostatic field, (if you have no plastic rods, then use a balloon rubbed on your sleeve). 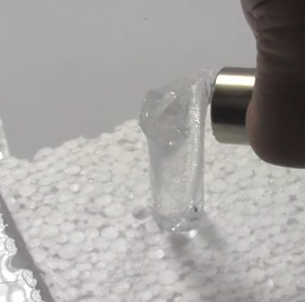 Water though is repelled by a magnetic field as shown using a finger of ice. Surprisingly, oxygen attracted to a magnetic field. Personally, I think the deflection of water one of the most important demonstrations you carry out in chemistry. That water has a dipole and enters into hydrogen bonding contributes so much as to our existence on the planet. The magnetic properties are illustrated by using very strong neodymium magnets. All you want to know about water is here on Michael Chaplin's comprehensive website, http://www1.lsbu.ac.uk/water/water_sitemap.html. The compounds formed between halogens have always fascinated me so when Derek Denby, involved in Salters Chemistry asked me to see whether the iodine/chlorine reaction could be carried out microscale, I quickly agreed because I had only ever done this in large combustion tubes. I used a dry preparation of chlorine carried out by heating 1g of anhydrous brown copper(II) chloride, which produces about 90 ml of chlorine so it is better to use a fume cupboard. 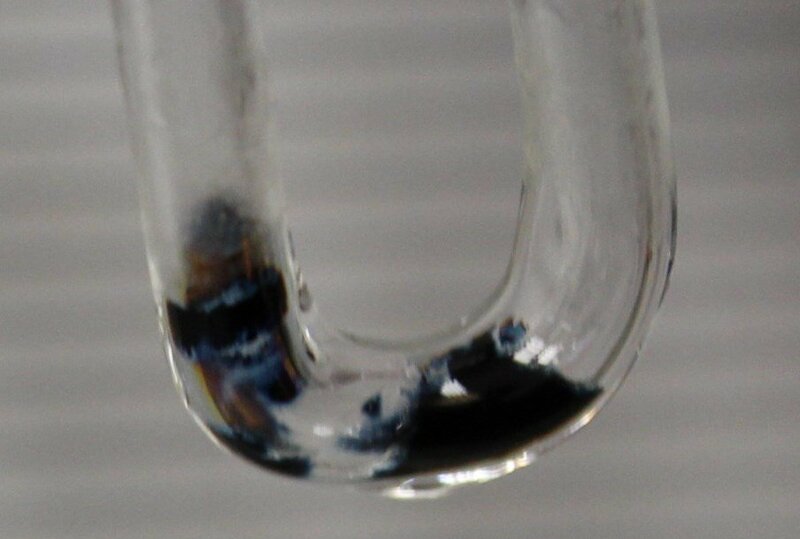 This is dried further with anhydrous calcium chloride and passed into a U-bend of 7mm medium-wall borosilicate tubing, containing a tiny bit of iodine. 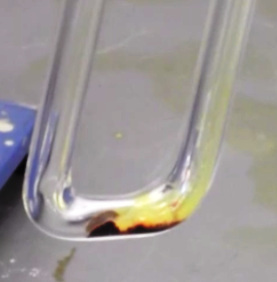 Immediately the brown liquid iodine monochloride forms follwied by yellow solid iodine trichloride.. See the video on https://www.youtube.com/watch?v=N89vQex7doM. This shows how to prepare anhdrous copper(II) chloride but more importanantly the dynamic equilibrium exhbitied by the two iodine chlorides changing with temperature demonstrated , something not easly possible with large combusion tubes.. Thanks must go to Jorge Ibanez and Bruce Mattson for alerting me to this fascinating topic. I am standing on the shoulders of giants. Well here is my take on the experiment. The smell of ozone is unmistakable. The rather chlorine-type odour can be detected near an electrical discharge. This allotrope of oxygen is not good for you although it has been connected with miracle cures. The ozone layer is very important to the existence of life on the planet. Have a look at http://en.wikipedia.org/wiki/Ozone for a sensible account. It is also made whenever the Hofmann voltameter is used. It occurs as a side reaction at the anode when platinum or lead are used as electrodes. Using the microscale approach, the mixture of ozone in hydrogen and oxygen can be collected in a 20-ml plastic syringe, I have found that the concentration of electrolyte, sulphuric acid needs only be 1M although many texts think its needs to be much higher. A low voltage supply set at about 9v is required. (9v batteries can be used but they get warm and are used up quickly.) The vial with potassium iodide solution indicates that ozone is now coming through and the 3-way tap is adjusted so that the gas can be sucked into the syringe by just physically teasing the barrel outwards, without sucking up liquid. Potassium iodide solution is added to the syringe and this immediately reacts with the ozone.to form iodine solution. This is microtitrated with 0.005M sodium thiosulfate solution (see method down this page) with starch as the indicator. The make up of the gases at the anode is only about 0.23% ozone, the rest being oxygen. A video is available https://www.youtube.com/watch?v=Jrd_qQWl8b0 . Plastic syringe is loaded with nitrogen and hydrogen. The mixture is passed over a hot iron catalyst and there is enough ammonia to convert he slightly acidic pure water (dissolved carbon dioxide) alkaline. This is demonsrated with Universal Indicator. The mixture of ammonia and oxygen is heated over a copper catalyst and the slightly alkaline tap water (hydrogen carbonate ions) becomes acidic as demonstrated with Universal Indicator..
Titration is a complex procedure requiring arithmetical and practical skills and an understanding of chemical equations and chemistry at the nano-level. The equipment is expensive for class use especially by beginners who might be clumsy as well. In this procedure, the mass of a vial with a drop of indicator is found and then with about 1 ml of one of the reagents. The other reagent is sucked into a Pasteur pipette. The screw of wither a clamp or a Hofmann clip is turned to add the the reagent dropwise until the first change of colour, on swirling, is permanent. The mass of this vial is then found. From these 3 mass values, and assuming the density of all these 3 dilute solutions is the same, the concentration of the other reagent can be calculated. Or for beginners, insert the 3 values in an excel sheet and find the result immediately. Students can be introduced to the proper equipment afterwards. Alkenes are produced by heating the alcohol over hot aluminium oxide powder. In a particular procedure, propene is prepared and hydrogenated with hydrogen over a palladium catalyst.